Today we had a “catch-up” day cleaning, throwing out, and resting…but…we did have time to fit in a short Geocaching quest. Rick led us on a short expedition to find a Geocache. What is Geocaching? Geocaching is a high-tech treasure hunting game played throughout the world by adventure seekers equipped with GPS devices. The basic idea is to locate hidden containers, called Geocaches, outdoors and then share your experiences online. Geocaching is enjoyed by people from all age groups, with a strong sense of community and support for the environment. We signed the log, and placed it in its secret hiding place for another Geocacher to discover. 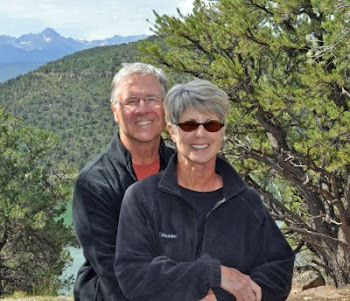 Lois & Hal were amazed with the process and the concept - This was their first adventure with Geocaching. Wahoooooooooo and congratulations to them!!!!!!! Yep, tomorrow Thursday the 27th of August we will be heading home. We leave behind some marvelous surroundings, but we’re able to enjoy outstanding memories! Some of the memories Lois and Hal will take will be the Norris Geyser area in Yellowstone National Park, the beautiful waterfalls, enjoying lunch at the marina, JoAnne laughing so hard wine came out of her nose, and Lois trying to spit out a cherry pit with the car window still closed! LOL JoAnne and Rick will bring home memories of the bear sightings (Ahhhhhhhhh…TWO bear sightings), lots of laughs, good wine, the stunning sites, and fun times with good friends. I have heard that geocaching is really fun. I hadn't even heard of it until last year. Thanks for sharing a little bit about it. A Bear! A Bear! A Bear! A Bear! Let’s relax today…On our own! Buffalo Jam…not the kind you eat! Getting from there to here!